Miss Beazley in January 2005. 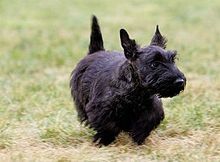 Miss Beazley (October 28, 2004 – May 17, 2014) was an American Scottish Terrier. She belonged to former U.S. President George W. Bush and former U.S. First Lady Laura Bush. She was best known for starring in BarneyCam videos with her half-brother Barney, who died in February 2013. Miss Beazley died from lymphoma on May 17, 2014 in Dallas, Texas. She was 9. Barney also died from lymphoma. ↑ "George W. Bush's Scottish Terrier, Miss Beazley, Dies". Time. May 17, 2014. Retrieved May 17, 2014. Wikimedia Commons has media related to Miss Beazley.